My son was so excited to make this meal with me. I told him that it was going to only take 12 minutes and he was like, seriously mom, the meatballs aren’t going to taste good in the microwave. Then, I took my Instant Pot out of the cabinet and he asked, what is that I was like my new appliances and he said, does that cook meatballs? I said yes and they cook pretty fast. He was like ok, let’s do this! My son loves making videos, he is planning on uploading a video to this recipe, for now, you just have the old type of pictures. This recipe takes about 15 minutes. Add the meatballs in a single layer on top of it all. 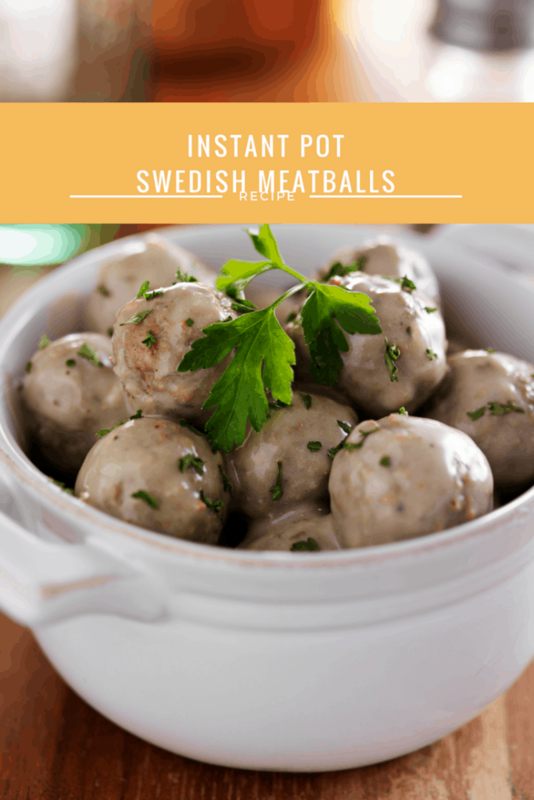 I loved how easy this was, but it burned in my instant pot. By the time the burn notice came, it was all cooked through, and it tasted great! But I would prefer not to have to clean out the burned mess! Any advice? Just make sure that you scrap the bottom of the pan. I never had this problem, but if you leave any part of the sauce unstirred, you will get this BURN notice. Made this and cooked it for 15 minutes bc I added time for higher altitude. I live at 4500ft. It turned out delicious. Thank you for the recipe! Oh I also used 13oz of whole wheat noodles. And 26oz of bag of swedish meatballs.